Home Mobile Bixby vs Google Assistant vs Siri: Which One Takes The Crown? Bixby vs Google Assistant vs Siri: Which One Takes The Crown? Bixby Voice just hit the market and people have already started the hate train. As much as we would also like to take a ride on that train, we at Beebom try to keep our heads cool whenever we are testing out a new product. It’s easy to hate on anything new, but every product, even the bad ones do have some redeeming qualities. Samsung might have failed with their own digital assistant in the past (S-Voice), but that in itself does not guarantee the end of the road for Samsung in this product category. So, before our prejudices make us disable the Bixby voice assistant forever, let us take it to a battle, with the best voice assistants of today. Who knows, you might probably be surprised with the results. 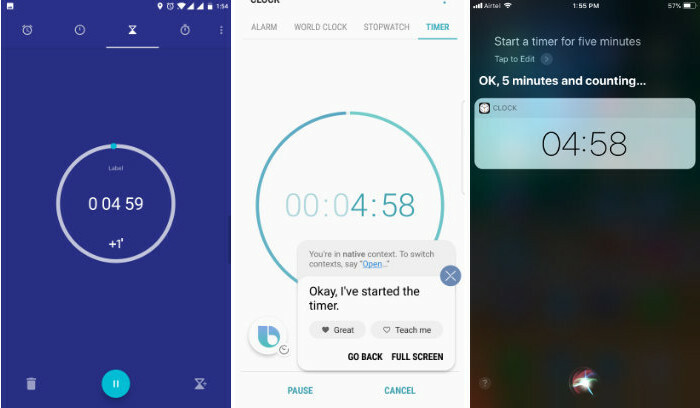 So, let’s put Bixby through its paces and find out which one comes out at the top. 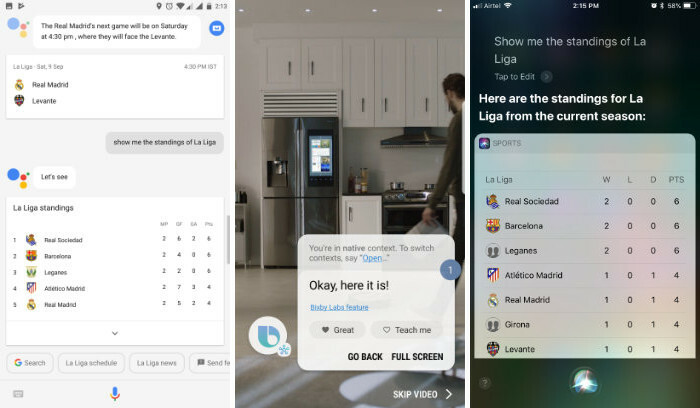 It’s Bixby vs Google Assistant vs Siri, let’s see which one takes the crown. One of the biggest features which matters to me when it comes to smart assistants is the ability to easily access them. 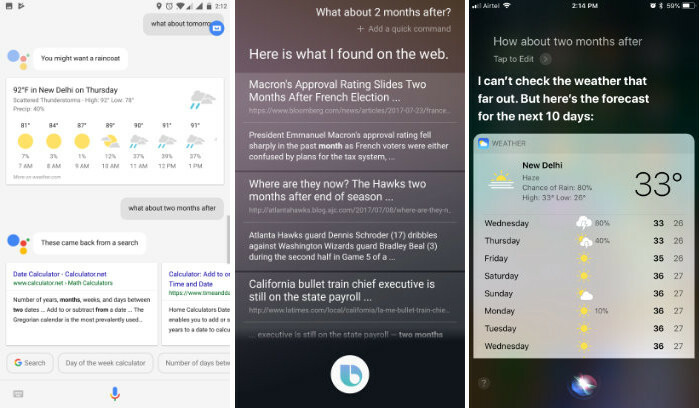 Even though Google Assistant is now present on iPhones, Siri can be accessed way more easily and hence is used more on iPhones. It doesn’t matter how good an assistant is if it is not easy to get to. 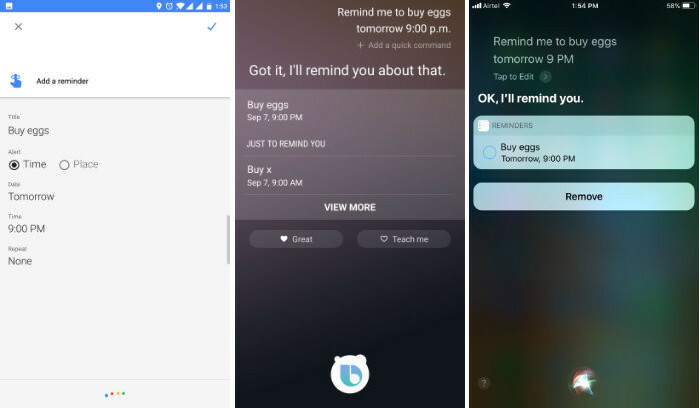 Now, both Google Assistant and Siri have a voice command and a long-press on home button shortcut to invoke the respective assistants. However, Samsung takes it up a notch by including a dedicated hardware button for its assistant. In addition, you also get the usual voice activation command (Hi Bixby). I think Samsung wins here, as a dedicated button to access the smart assistant makes it really simple. I also like the placement and the implementation of the button. The button is placed just below the volume rockers and is easily accessible with both hands. The implementation is also pretty cool. 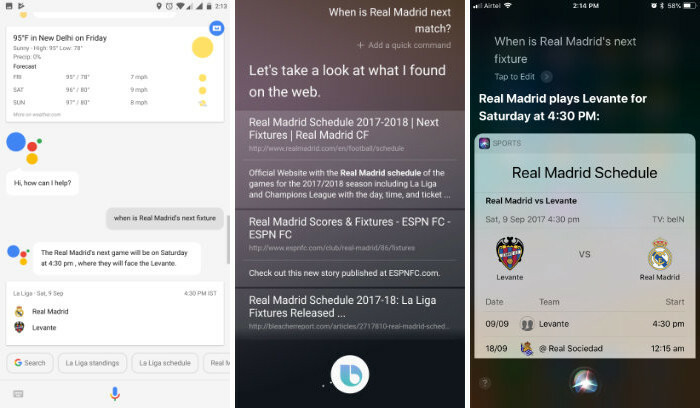 You push the button once to open the Bixby Page, which is similar to Google Now page. To talk to Bixby, you will have to hold on to the button, kind of like using the walkie-talkie back in the day. It sure does brings back a lot of memories. Although I can use the voice command to access Bixby, I am finding myself using the button more and more, both for fun and accessibility. If I wanted to compare the experience of the Bixby button, the only thing that came to mind is the “clicking” feature of S-pen. It’s not necessarily needed, but boy is it addictive. 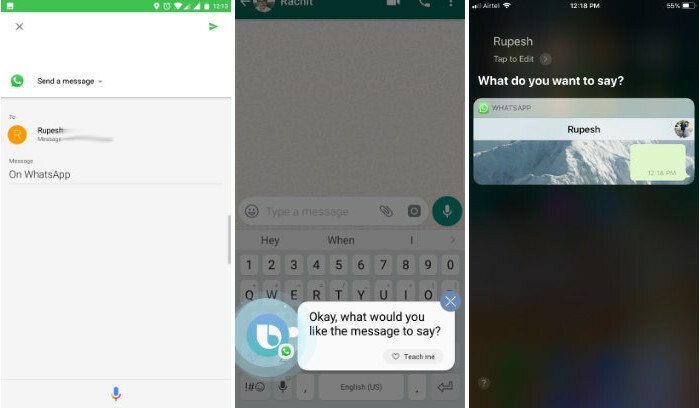 Now, that we have covered the accessibility part, let’s test out the assistants head to head by asking them to perform the usual functions which we expect from them. This section will deal with the actions related to user interactions with the phone and the apps. Similarly, the later sections will deal with things like queries, contextual awareness, and so on. So, let’s not waste any time and start with our first section, i.e., phone actions and interactions. Let us start with a simple action which we have to perform quite frequently. We will launch the assistants and asked them to take a screenshot for us. 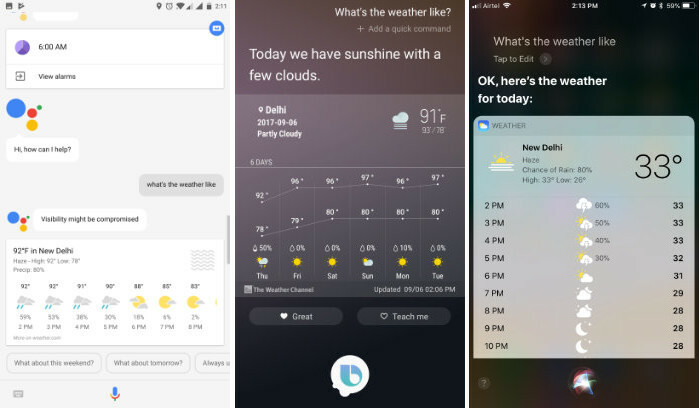 As you can see, both Bixby and Google Assistant performed the action fairly easily. However, I prefer Google Assistant over Bixby in this case, as Google Assistant allowed me to edit and share the screenshot as soon as it took it, while Bixby asked me to go to the gallery. Google Assistant reduced one step for me. Lastly, as you can see in the pictures, Siri failed to execute the action. Let’s check out if our assistants can send messages and call on our behalf or not. First, we will try to send a normal text message and then take it up a notch by using a third party app. 1. Send a message to Rupesh. 2. Send a message to Rupesh on WhatsApp. 3. Let’s try calling Rupesh now. As you can see, all the three assistants can perform these tasks easily. This one is a tie. One of the most frequent things to do on a smartphone is to install and uninstall the apps. I install and uninstall a dozen of apps on weekly basis, some for work purposes, and some because, I just love to check out new apps. 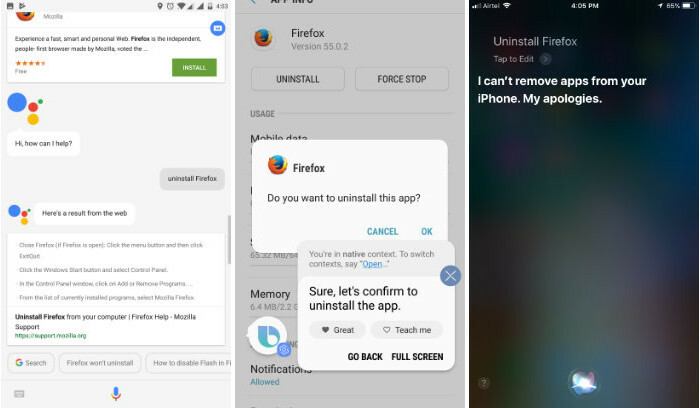 If you also love to check out new apps, you might also be installing and uninstalling quite a lot of apps. Let us see if our assistants can help us in that or not. 1. 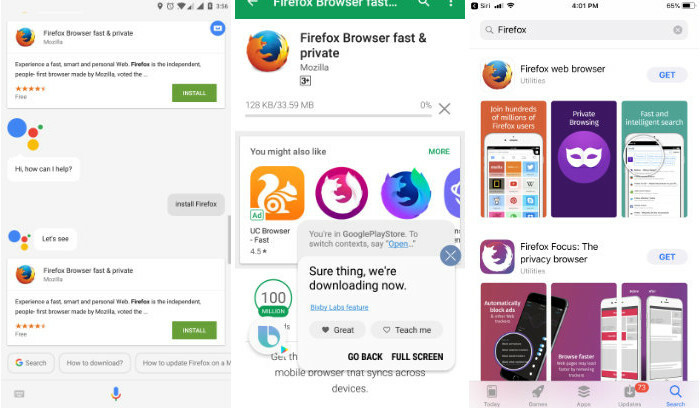 Let us try installing a well known app like the Firefox Browser. 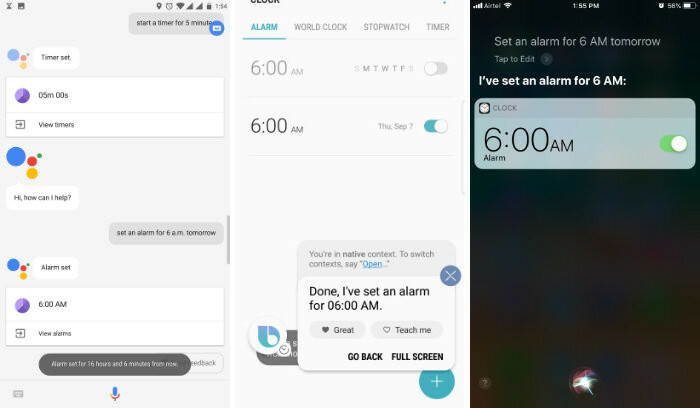 As you can see, Samsung’s Bixby is the clear winner here. While Google Assistant did well to give me the link for the Firefox Browser app, further two taps were still required to install the app. Siri came second with directly launching the App Store. 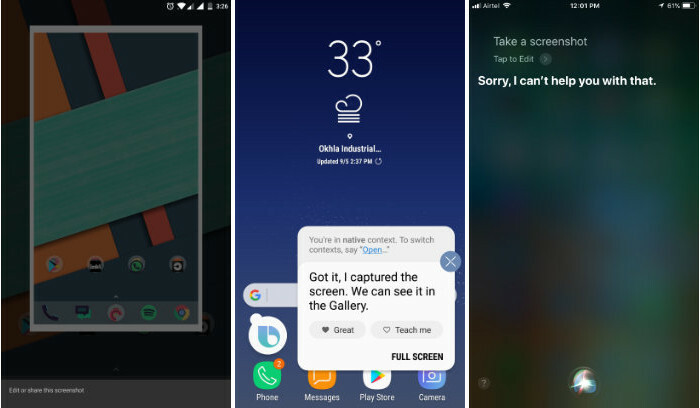 However, Bixby beat both of them hands-down as not only it launched the Play Store to open the app, it even started the download and installed the app on my device, with no further assistance. 2. Now, let’s try uninstalling the same app that we downloaded right now. Hmm, that’s weird. The assistant which was supposed to lose is doing pretty well here. While Google Assistant just showed a Mozilla help web page with instructions for the uninstall process, Siri flat out said no to me. Bixby however, did which was asked of her, and uninstalled the app. The only thing she needed was my confirmation before so proceeded with the process of uninstalling the app. Bixby wins this round too. Notifications are something which each of us have to deal with multiple times a day. How cool it would be if we can deal with them without touching our phone. Let’s see if our smart voice assistants can help us with that. We will start with something as simple as asking the voice assistants to show us our notifications. 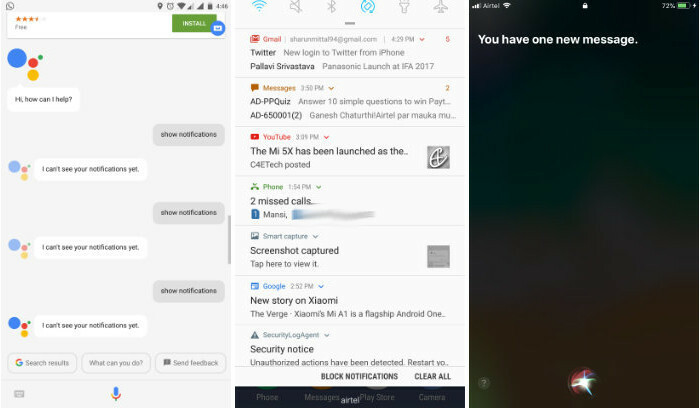 As you can see in the picture above, Google Assistant is unable to show me my notifications, while Siri can show the number of notification but not the notifications themselves. However, a point to mention here is that Siri does recite the notifications instead of showing them. Again, Bixby wins here as it pulls down the notification shade perfectly. 2. Now, let’s try to clear all notifications. 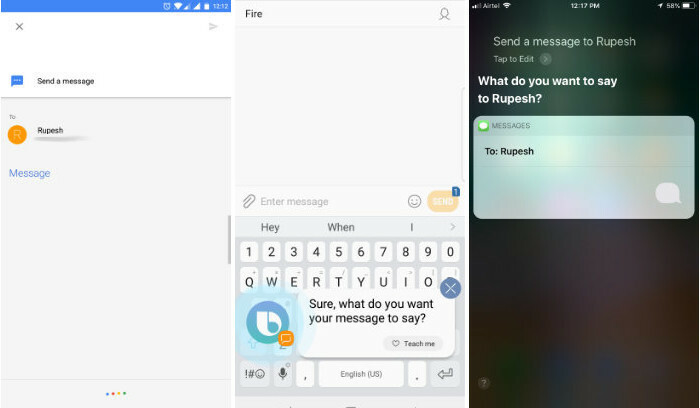 Following the trend, Google Assistant and Siri failed while Bixby easily performed actions. One neat thing about Bixby is that you can even remove individual notifications. 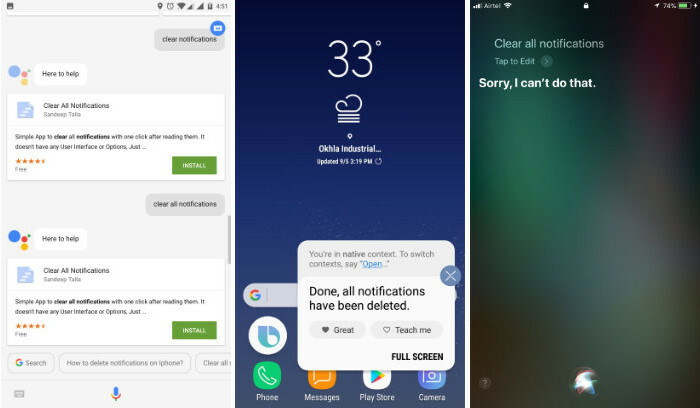 Just say, “Clear notification from ‘app name’” and Bixby will remove the notification from that app. Now, that is cool. This is one of my most used assistant commands. I hate to open the settings, search for the specific one I am looking for, and then perform whatever action I want to perform. Instead, I just ask my voice assistant to do that for me. Now let’s see which of them can take the crown here. First, we will just try a very common task. 1. Turn on the Bluetooth. As you can see, all of them performed very well. Now let’s try something a little harder. 2. Turn on the night mode. I was expecting Bixby to win here, but I was quite surprised to see Siri handling the request so well. Google Assistant could not do it. I even tried multiple keyword combination with Google Assistant, but none of them worked. Like above, all the assistants were tested with more settings related questions. The results came out to be the same. While all of them could perform regular tasks (WiFi, Bluetooth), Google Assistant failed at the more complex ones. 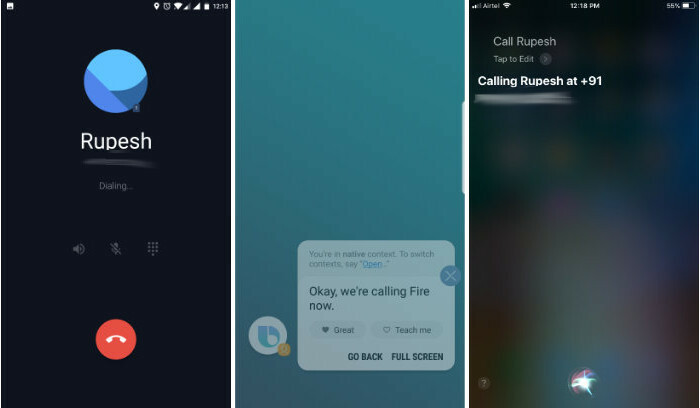 Bixby and Siri could do almost everything correctly. Now, that we have taken a look at the system level interaction of our assistants, let us see if they can help us in using third-party apps or not. To start simply, we will just ask them to launch an app. 1. 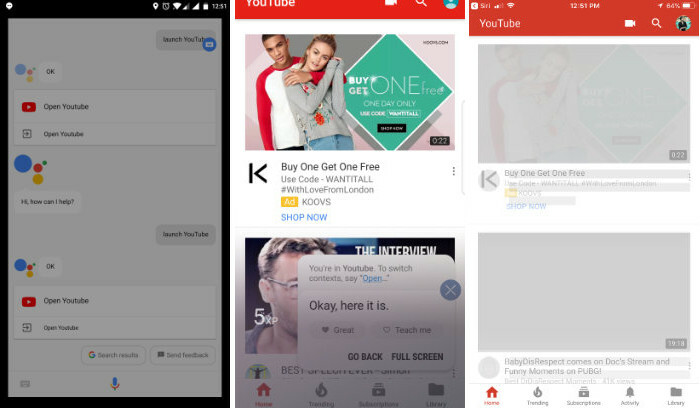 Let’s try launching the YouTube app. All the three assistants launched the YouTube app without any hiccup. Now let’s try something a bit more complex. We will try to launch an app and make it do something. 2. 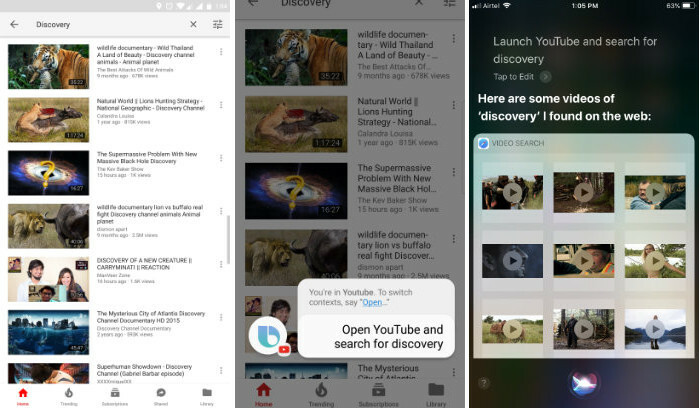 Launch the YouTube app and search for “discovery”. Bixby takes the crown here too. It can easily launch apps and perform tasks inside it. For example, you can launch a browser and tell it to visit a website, you can launch Facebook and directly see your notifications and much more. 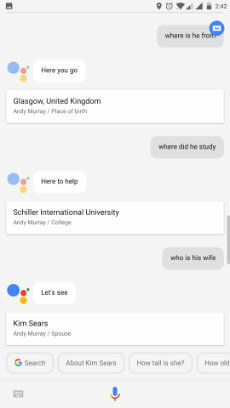 In the above test, Google Assistant was also successful but on the second attempt. I needed to change the keywords to get it to work. However, Siri could not perform the action even after trying different keywords. This is one of the most common actions which any voice assistant should be easily able to perform. 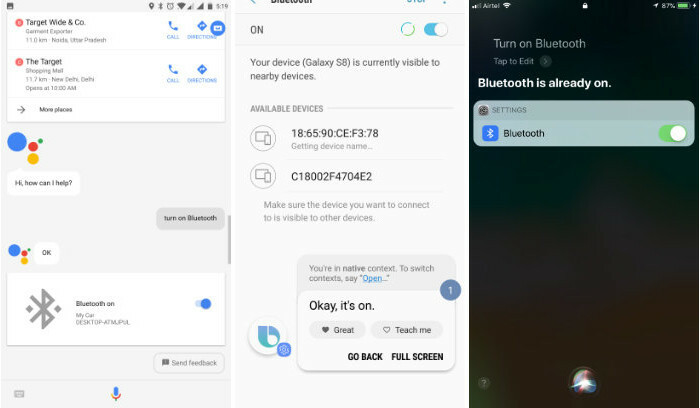 From our previous comparisons, we know that both Google Assistant and Siri can easily perform this function, so it just remains to see if Bixby can do this or not. As we can in the picture above, Bixby can also easily create calendar entries without any problem. We will end this section by asking our assistants to perform some basic tasks such as setting up reminders, alarms, countdown timers. All the three smart assistants were able to perform these tasks with ease. 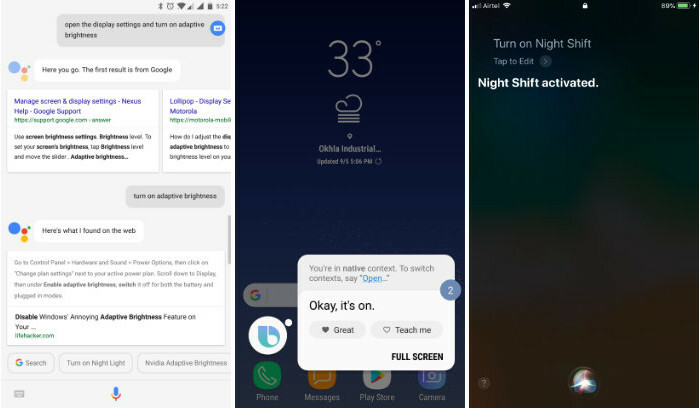 However, considering all of the above actions, we can surely say that Bixby is far better at controlling your phone than Google Assistant and Siri. In fact, Bixby allows you to do pretty much everything with your voice that you can do with touch. 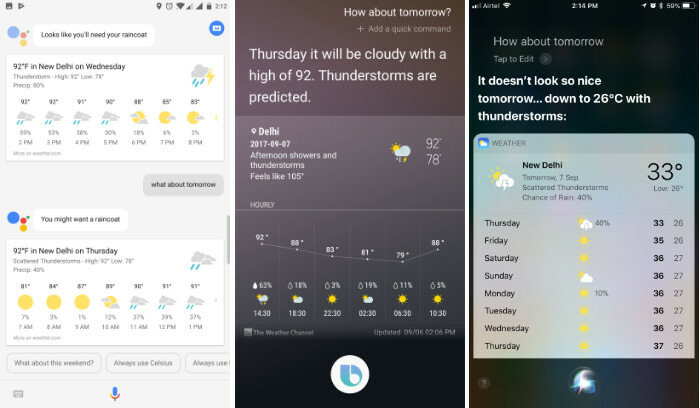 Both Google Assistant and Siri can perform basic actions, but they fail to do anything which is more complex, and involve more than two steps. Bixby is the clear winner here. In this section, we will just ask some usual queries from our assistants. Our main aim is to find how they perform under normal conditions. This will give us a baseline to work with, and then, we will move on to more complex and contextual questions in the next section. As expected, all the three assistants could easily answer this query. This query was also handled pretty well by all the three assistants. 3. What about two months after? Bixby gave up on this one. It is showing me web links to some random pages. Google Assistant also cannot show the weather so far out, but it was intelligent enough to give me the links of websites which can show me the required data. Siri handled it pretty intelligently, as it informed me that it cannot show me the weather pattern for such a far away date and gave me the forecast for the next 1o days. I think I prefer Siri here. 4. When is Real Madrid’s next fixture? When it comes to sports related questions, Bixby is pretty bad, to say the least. Instead of showing me Real Madrid’s next match, it showed me the links of the websites containing the information. Google Assistant was quick to show me the next match. However, Siri takes the cake here by not only showing the next fixture but all the future fixtures of Real Madrid too. 5. Show me the standings of La Liga. Even after asking the same question with a ton of different keywords, Bixby had no idea what I was asking about. Every time it was opening a random web search or a random settings pages. Both Siri and Google Assistant were quick and smart to answer my question in one attempt. 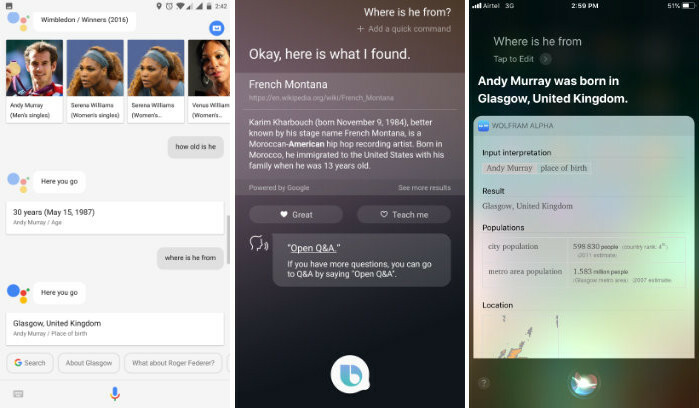 Needless to say, when it comes to queries, Bixby is nowhere near Google Assistant and Siri. When it comes to sports, Siri is the better one. However, in all the other queries, Google Assistant is slightly faster and accurate. Now, this will be a true test of the assistants, as in this section we will test the conversational skills and contextual awareness of our assistants. An assistant can become truly useful if it behaves more like human than AI. Having contextual awareness plays a big part in that. So, let’s try them out. 1. Who won the Wimbledon 2016? I hoped that all the three assistants will be able to handle a question as simple as this. But, alas, only the Google Assistant could answer this question. Now, since I wanted to check the contextual awareness of the smart assistants, I am ready to give them one more chance. That’s why I asked both Siri and Bixby a simple question. 1.a Who is Andy Murray? 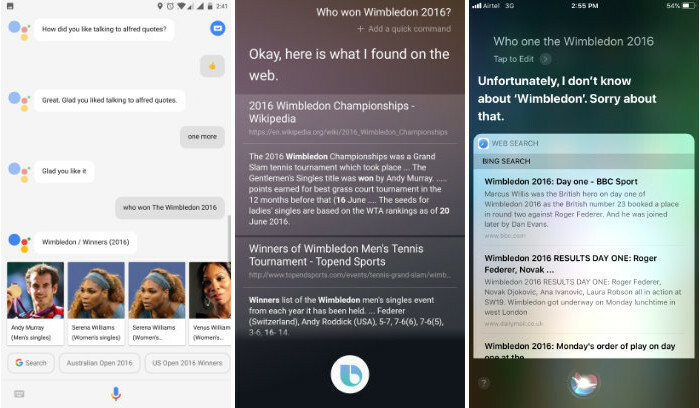 As you can see, Siri got it right, but Bixby is again showing her love for the webpages. 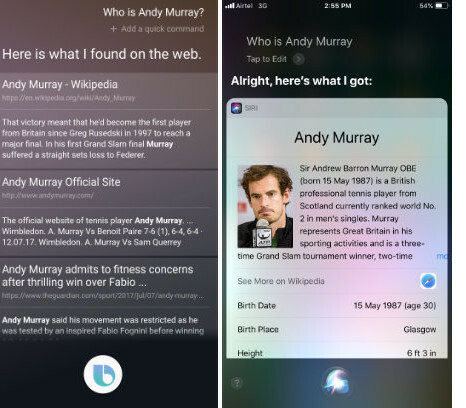 I asked this questions because I wanted both Siri and Bixby to have a context for the questions I was going to ask next. But, it seems, Bixby has lost even before the race started. Let’s see if Siri can keep up (now that she knows the context). As expected, Bixby failed spectacularly. However, I was surprised to see Siri getting the right answer. Let’s move on to the next question. Again, Siri got it right. It feels like Siri is going to give a tough competition to Google Assistant here. Okay, moving on with the next question. It seems Bixby has totally lost it, now its just showing random pages. Siri came at the end of her wits at this stage. 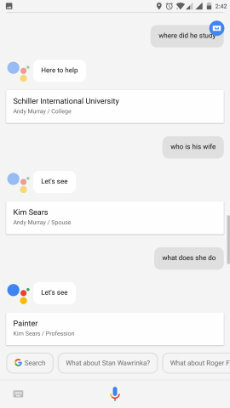 Let’s continue our test with Google Assistant to see if it can handle some more questions. 5. Who is his wife? Again, Google Assistant got it right. Let’s end this with one last question. 6. What does she do? Now, that’s impressive. Google Assistant’s contextual awareness is mind-boggling. Remember we didn’t even start with a straight-forward question, but a question at which both Bixby and Siri failed at. Answering five more questions based on the context of that initial question is really impressive. Bixby failed at the first question itself. Siri got to the 3rd question after we gave her a context. But, I should mention that, even this feat took multiple attempts to achieve. There’s no doubt here, Google Assistant is the clear winner. Personality and Quirks are those aspects of virtual assistants which are not given that much importance. It’s because they do not have anything to do with their functionality. However, they do add a human element to the equation, which as I said earlier, is needed to make our virtual assistants more approachable. Now, these things are also subjective. So, you and I might prefer different smart assistants depending on what we prefer. That being said, let’s check out some of the personality and quirks of our smart assistants. 1. Tell me a joke. Let’s start with asking them to tell us a joke. As you can see, all of them can tell you jokes. However, Siri just tries to be a little cheeky and her answers repeat after 3 or 4 attempts. 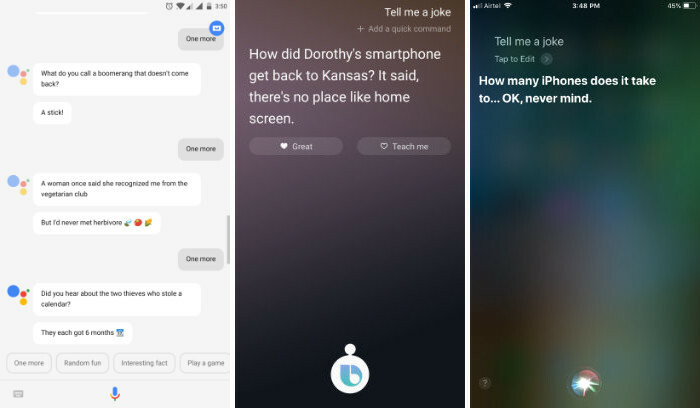 Bixby is better than Siri and her jokes are not repeated frequently. However, Google Assistant is the best as she will tell unlimited one-liners, most of which will make you smile. 2. Sing me a song. Now, let’s see how good a singing voice our assistants have. Siri behaves as if she is angry. 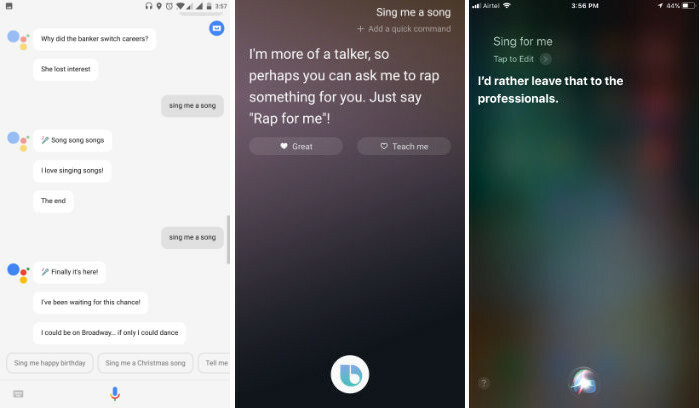 She outright denied my request, while Bixby said that she can rap. We will check out her rapping skills next. Google Assistant sang small songs in a quite natural sounding audio. I am impressed. As Bixby said she could rap, let’s check out their rapping skills next. If it was a real rap battle, the crowd would have gone crazy over Bixby’s rapping skills. Bixby is dropping some mad rhymes. Siri comes next while the Google Assistant didn’t rap and just recited a poem for me. I hope you get what I was trying to do here. I asked them a lot more questions and I felt that Google Assistant has a far better personality than Siri and Bixby combined. However, your opinion might differ. 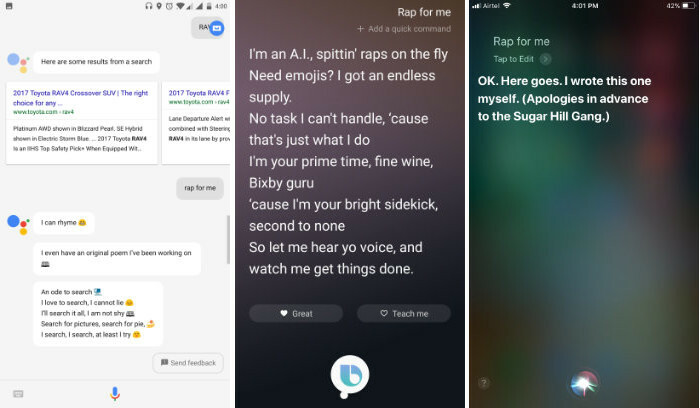 For me, Google Assistant is the clear winner here, but still, Bixby can rap like crazy. SEE ALSO: Google Assistant on iPhone vs Siri: Can Google Assistant Compete? 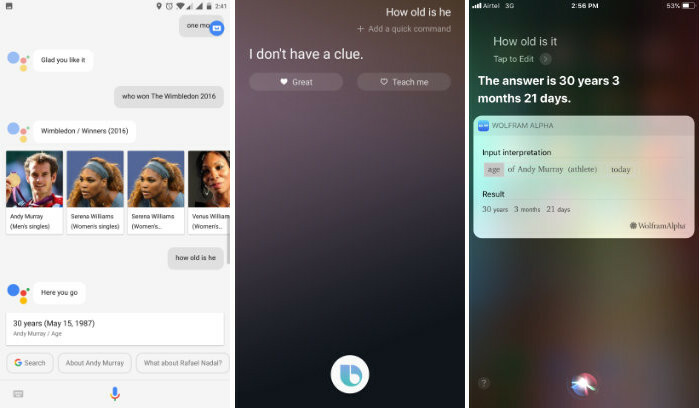 Bixby vs Google Assistant vs Siri: And The Winner Is? It was a tough fight, and for the first time, Google Assistant is not the clear winner here. Bixby beats both Siri and Google Assistant when it comes to controlling your smartphone. There’s no action that Bixby cannot perform. 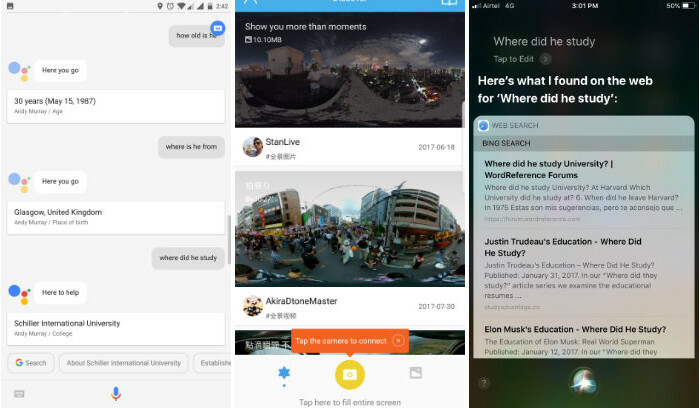 However, when it comes to usual queries, Bixby bites the dust. Both Google Assistant and Siri did great here. But, when the time came for the real test (contextual awareness), only Google Assistant could stand tall. Siri has improved a little, still, Google Assistant is the one to beat here. Google Assistant’ s personality is also richer than the other two. To sum up, if you want to control your device, Bixby is the way to go. However, if you want to extract information from the web, Google Assistant is still the king. Siri shines here and there but still needs a lot of improvement. 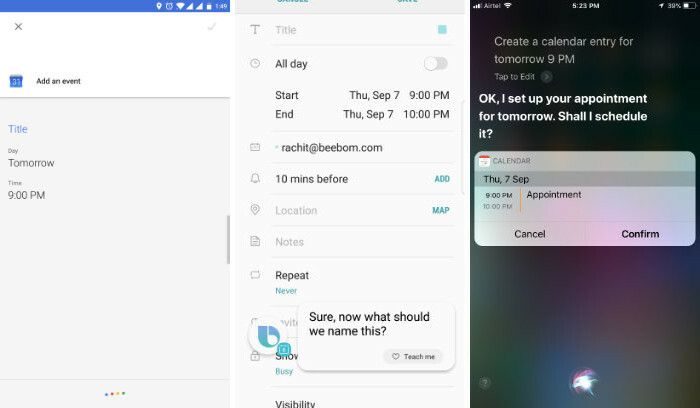 In an ideal world, the best assistant will have the combined power of Bixby and Google Assistant. Until then, your favourite assistant depends on your usage. For me, it’s still Google Assistant, but it is impressive to see Bixby (which was declared dead on arrival) doing so well in our test.